What Are You Laughing At? A Comprehensive Guide to the Comedic Event is an enjoyable exploration of comedy with a benevolent and amusing guide. Given O’Shannon’s background in TV comedy, the book leans towards television and film comedy – it is peppered with anecdotes of O’Shannon’s time on Cheers and Frasier, but it more often makes use of colloquial jokes (knock knock, “Your mama…”, etc.) as the bases of analyses. These jokes are rigorously broken down, torn apart and rewritten to decode just what makes us laugh. Before getting into an analysis, the first thing one notices about the book is an intimidating number of diagrams, tables and charts for a book about jokes. O’Shannon realises that everything is a sliding scale and open to interpretation, and is careful to remind us that the diagrams are only a visualisation of the written material. Viewed this way, the diagrams are fine; taken too seriously they come across as those nasty diagrams that the boys in Dead Poets Society (1989) ripped out of their textbooks. Towards the end of the book the charts lost me. They’re simply too big, and more and more attention is paid to getting the charts right, rather than the information itself. The appendix with the full charts is overwhelming. What Are You Laughing At? is nothing if not comprehensive, covering all the things we laugh at. After a brief survey of common comedy theories, and an injunction against categorising comedy (into parody, farce, slapstick, etc. ), O’Shannon presents his outline of the “comedic event”. The comedic event constitutes a receiver, receiving some comedic information, which elicits a response. This definition of the comedic event goes beyond jokes because O’Shannon knows we don’t only laugh at jokes (or comedic information). Sometimes we laugh to be polite, or out of cruelty, etc. And if someone laughs at something, who are we to say it wasn’t funny? O’Shannon doesn’t dismiss these varied forms of laughter; rather he includes them in his analysis, such that any form of laughter by anyone at any time will find a category in O’Shannon’s taxonomy. Comprehensive indeed. But mapping all the possible arenas in which a laugh (or comedic response) can occur amounts to a map of all human interaction. This is a mammoth task, but it is important to recognise that the joke’s context and the vehicle of the joke have an impact on the humour: your own kids are much funnier to you than other people’s kids; a joke that works down at the pub on slightly drunk people may be no good in a play, etc. The knowledge that we bring to the joke, and our expectations form a large part of why we laugh – when the funny guy at the office tells a story, we’re all primed for a good laugh, but Mormons at the door will have to work very, very hard. To this end, the book is divided into three parts: before the event (‘Elements of Context: the reception factors’), the event itself (‘Comedic Information’), and after, or surrounding, the event (‘Enhancers, inhibitors, and aspects of awareness’). The first and third parts of the book deal with these aspects external to the comedic information – context, delivery, social needs, our feelings about the source, how we feel on the day, cruelty, superiority, etc. While these first and last sections do provide food for thought, for a screenwriter such as myself the great insights of the book occur in the middle section, on ‘Comedic Information’, where O’Shannon breaks down the jokes themselves. “The goal of comedy is to create and maintain incongruity for as long as possible, not resolve it away” (132). It’s not that the mind finds an incongruity and explains it away, but that the mind finds an incongruity and dwells in it. Further humour can be added to the first incongruity, piling on multiple incongruities at varying levels of complexity. The ‘aha’ moment of the book is when O’Shannon tells the same joke in three ways, following his breakdown of the presentation of information (straightforward information, recontextualisation and gap-filling). This is an inspirational moment, demonstrating how it’s done. Having thought of a funny situation, how can I create the best possible version? Should I tell this as straightforward information? Or will my audience be expecting something a little more high-brow, with gap filling and recontextualisation? 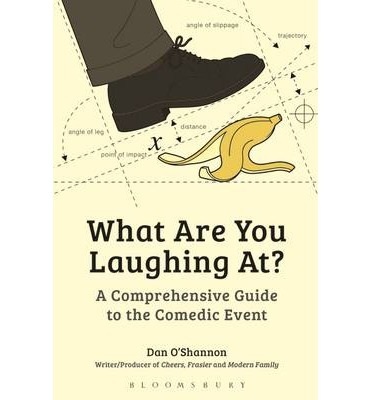 A follow up textbook which applied the diagrams and tables to the creation of comedy would be most welcome, but as O’Shannon tells us at the start, reverse engineering comedy is almost impossible. Comedic inspiration may remain a mystery, but O’Shannon provides the tools for writers to get the most out of that inspiration.